Picking them is a metaphor for life. Good things don’t come easy, and some of the best come with a good deal of itching: our raspberries grow in the same niches favored by poison ivy, stinging nettle, wild blackberry, wild roses, and mosquitoes, and the tiny berries take a long time to pick. But the reward is wonderful. 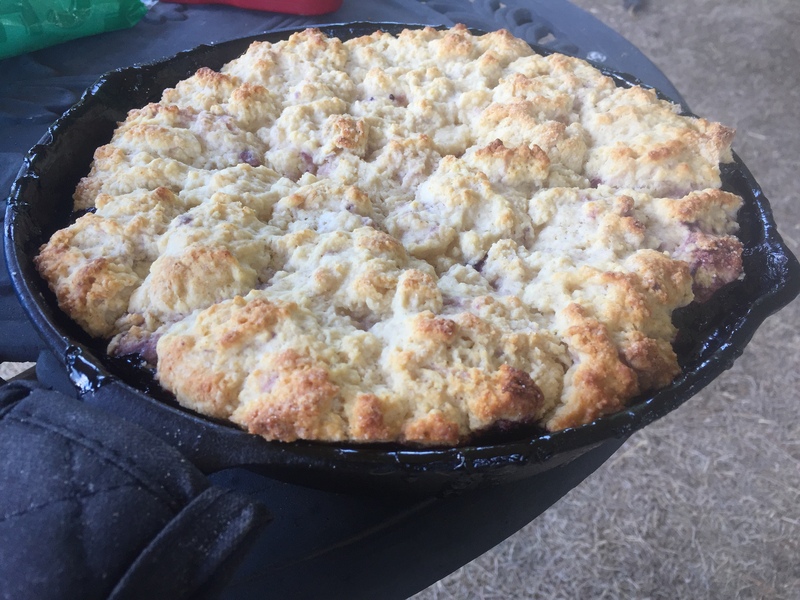 This cobbler takes a bunch of berries, so I tend to reserve it only for special people, like myself and my wife. I bake it in a 9″ cast iron skillet, because I like it that way! A perfect celebration of the perfect wild fruit of early summer. Baked in a 9" cast iron skillet, because it looks and tastes better that way. Preaheat the oven to 375 degrees. Combine sugar, cornstarch, and hot water in a large saucepan. Bring to a boil over medium heat, while stirring. Continue to stir and cook until it starts to thicken, about 1 minute. Add the berries and gently stir in. Be careful not to smoosh the berries, and cook only until the berries are hot - do not boil! Pour the berry goo into a 9" cast iron skillet, or some other deep baking vessel if you aren't properly equipped. Spread 1 tbsp of chopped butter over the surface of the berry goo. The topping is just a simple shortbread. Sift together the flour, sugar, baking powder, and salt. Add the butter and cut in (I usually just use my fingers, because I don't want to wash stuff. But a quick few pulses in the food processor would be best) until it resembles corn meal with a few pea-sized chunks of butter. Stir in the buttermilk just until combined. Don't over-mix, just moisten the dry ingredients. Drop the dough by the spoonful on top of the berries. It should cover fairly well, but do leave a few gaps here and there. Optionally, brush the top of the shortbread with milk, and sprinkle with sugar for extra sparkle. Bake 35-40 minutes, until the shortbread is lightly browned. Resist the temptation to dig right in until it has cooled for at least 5 minutes.